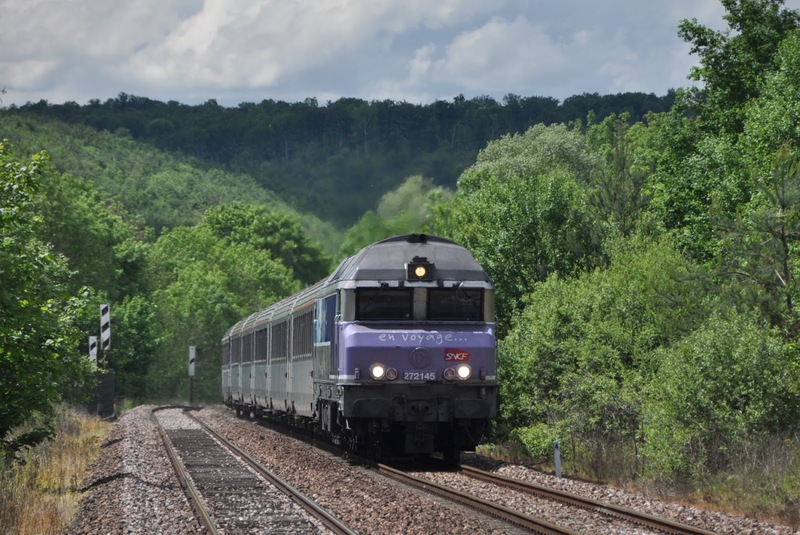 Almost certainly the shot of the trip- CC72148 near Luzy-sur-Marne with the 15:12 Paris-Belfort. We drove down to Folkestone for the 09:06 shuttle. No delays on this occasion and we were into France on time with 9827 pushing. Heading straight for Line 4 the diagrams came out to see if we could pick up any shots along the way. After dismissing the Lille based BB25500's it was discovered that we would pass quite near to Laon around the time of the 12:35 Laon-Tergnier. 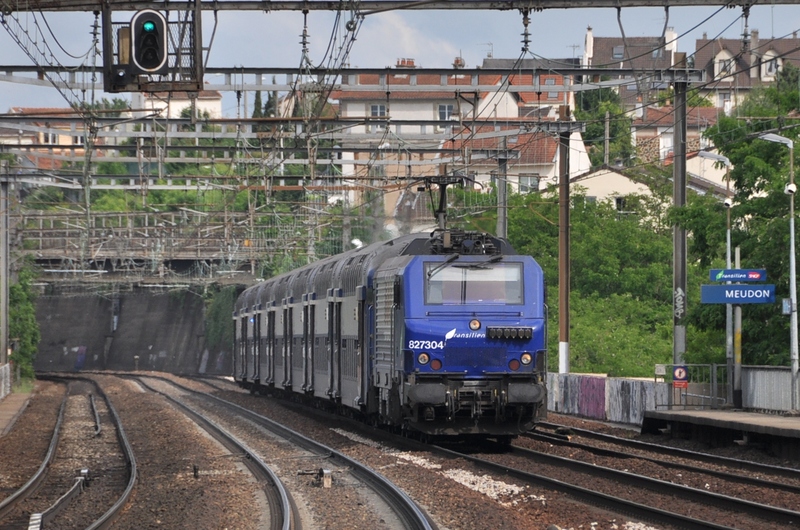 We headed down to the station at Versigny (close to the motorway) and were rewarded by blue 67626 and the sun appearing. An excellent quick win to start the trip. Time was now however scarce to make the 13:12 Paris Est - Belfort. Consideration was given to riding this from Chaumont to Vesoul and back, but it became obvious that we wouldn't quite make it in time. 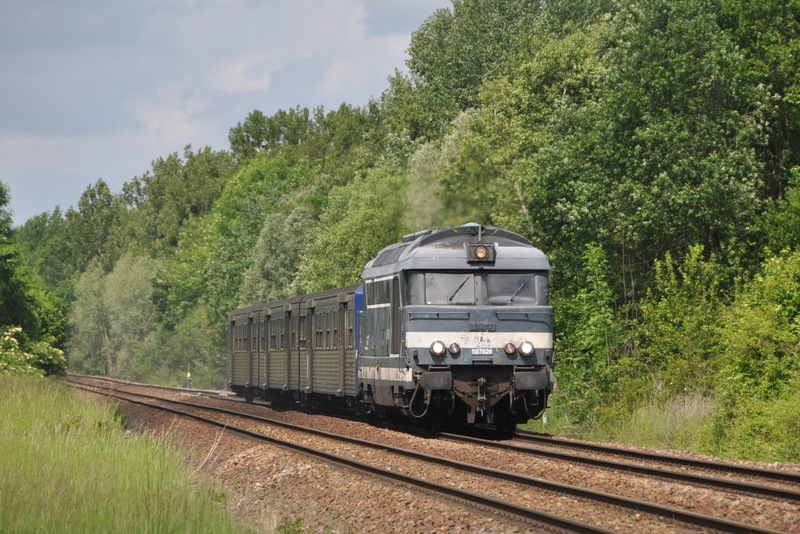 A race down the motorway saw us arrive at the disused station of Clairvaux (between Troyes and Chaumont)- the location was more of a 'this is the closest place we can find' than anything else as we knew it was going to be *very* tight to make the train at all. This proved to be a very good decision- 72145 appearing on the train less than a minute after we got into position! Going round the corner to the researched location would definitely have missed us the shot. Another silver lining- 72145 is my biggest dud- so I had missed wasting another trip behind it! Back in the car and down towards Luzy-sur-Marne (south of Chaumont) for some shots by the canal. Google research had revealed one location where the sun would be on the right side just south of Foulain. 72148 duly appeared in a lucky patch of sun with the 15:12 Belfort. As we were heading back to the car Europorte loco 4002 ran north with a train of tanks (I thought there wasn't any freight on this line!). Next on the agenda was a photograph of the 16:44 ex Belfort- the one train of the afternoon for which the sun should be right for. It wasn't to be- the light was dire and we ran out of time to get to the location we wanted. The shot of 72121 could have been worse- but wasn't really what we had driven all this way for! Back to Luzy-sur-Marne for the next few trains. Missed the 16:40 Reims - Culmont-Chalindrey due to a timetable reading error on my part, but photted 72190 on the 16:42 Paris - Culmont-Chalindrey. The last daylight photo of the day was then 72157 on the 18:02 ex Belfort. Just in front of this we saw another freight heading south- EWS 66249 with curtain side wagons. 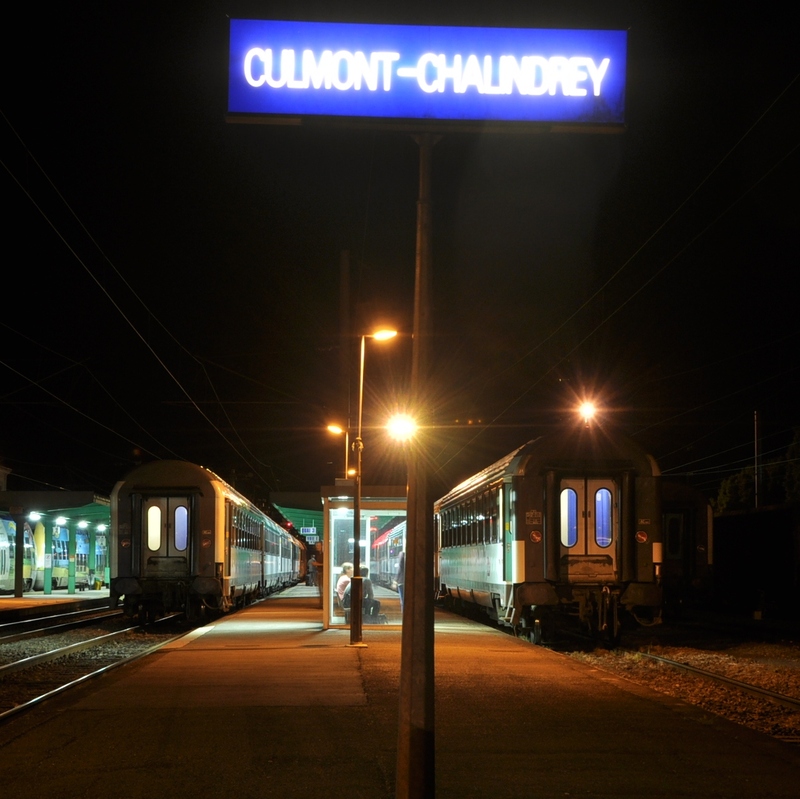 Drove back to Chaumont and parked the car up before taking 72186 to Culmont-Chalindrey on the 18:12 ex Paris. On arrival 72141 (if I remember correctly) flew through a few minutes later with the 18:42 to Belfort. We retreated to the pizzeria close to the station for dinner and to shelter from an approaching thunderstorm. Good food and very quick- thanks to those who offered advice on what to do in Culmont- This restaurant certainly seems to stay open until at least 10pm (on a Friday) and there are a few bars around the town also. Back at the station BB26064 (En Voyage) was in position to work the Cerbre sleeper, while 26168 would take us south to Marseilles. CC72148 arrived with the portion from Strasbourg. We should really have boarded and scored the loco for the shunt... but that thought didn't occur until afterwards! A few minutes late we left behind the Sybic and bedded down into a very warm couchette to head south. A good first day. Bailed off the sleeper at Arles feeling we had cooked enough and not got an awful lot of sleep. 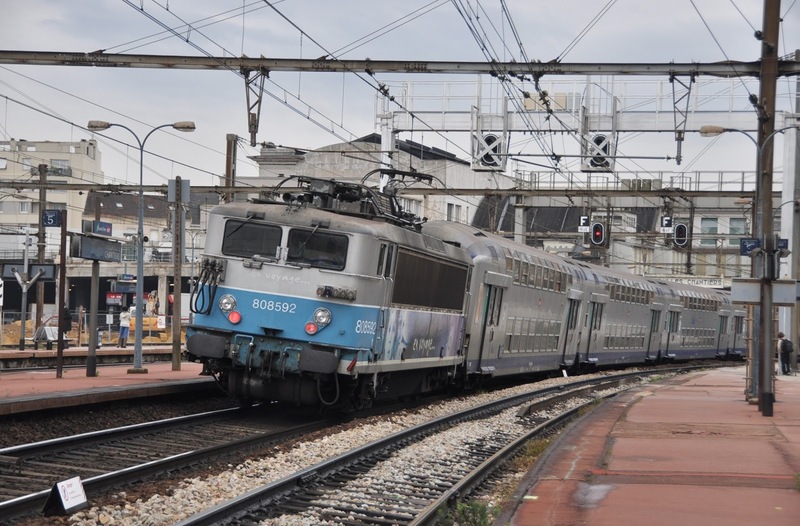 The simple aim today was to spend the morning on the Cote Bleu line and then head to Nimes for the Cevanol up to Clermont-Ferrande. What could possibly go wrong??? Strangely the first train to Miramas seemed to have disappeared without trace... a gentlemen saw us looking closely at the timetable and informed us there was a strike... But that was supposed to finish Friday morning? No? Apparently not. Anyway no major damage yet, the next train got us to Miramas in time for the 07:07 to Marseilles... which was a kart. Cheers then. I wasn't overly concerned as it is common for at least one vice on this line. Got off at Niolon and thought we'd better check the departures to get us back. Bad news. A train back to Miramas in an hour, then nothing until a single evening train around 8pm. Ok then. Guess we're taking the train in an hour and no scenic shots. Wandered to the spot we were intending to photograph and then had a paddle in the sea before heading back to the station. Joked that there are far worse parts of the world to be stuck in if the train didn't show. The train didn't show. 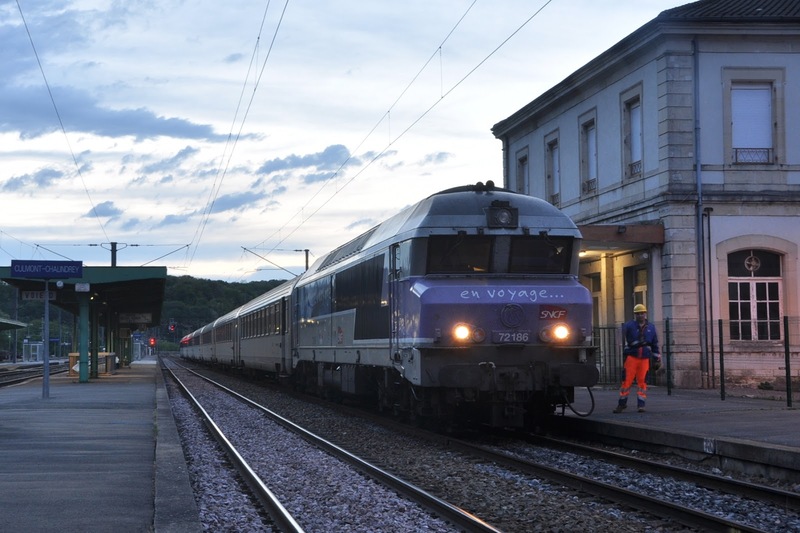 After a while the French group on the platform called the inconclusive SNCF hotline... then left. We headed into town in search of a shop and somebody who might be able to find us a taxi. We'd definitely not make Cleremont-Ferrande off the 19:54 to Miramas... if it even showed! Eventually got a dodgy taxi to L'Estaque where I thought there would be trains. On the way the taxi driver insisted that we went for a trespass along the railway so he could show us the wonderful view. Very nice. Next time I have to make small talk with a French with a taxi driver whom I don't understand I might not say that we are landscape photographers! No trains from L'Estaque for hours either so headed to the bus stop. You know a rail trip is going well when you are waiting at a bus stop. Bus took for an eternity and eventually deposited us at the end of the metro line having taken a tour of some of the social 'delights' of Marseilles. Arrived at Marseilles St Charles just after midday. Not the most productive morning and no chance of getting to Nimes for the Cevanol. 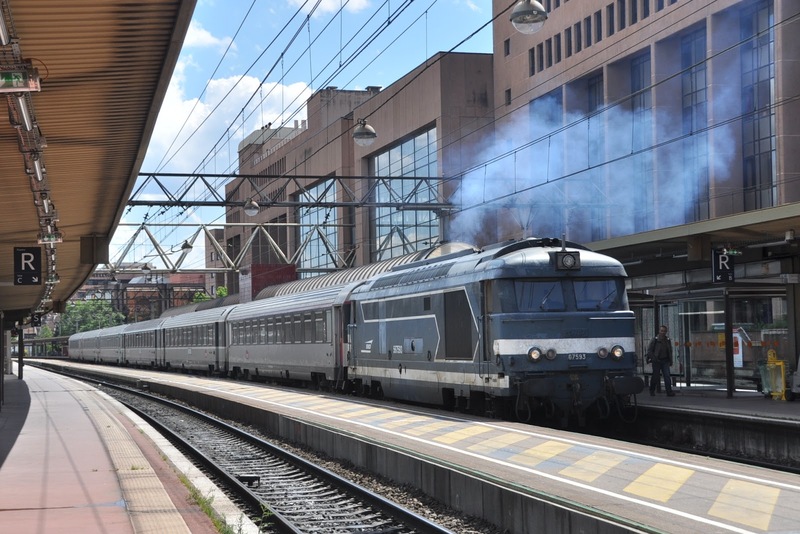 BB67593 smokes away at Lyon Part-Dieu preparing to work the 15:33 to Tours. The diesel would work to Nevers. Time to get out of the strike which through calls back home seems to be isolated to the TER Provence-Alps-Cote d'Azure region. 12:42 TGV to Lyon does the trick with an 18 euro res. Fortuantely a 'plan B' was formulated which took the afternoon hauled turn from Lyon to Nevers and then got us to Cleremont-Ferrande from the north. 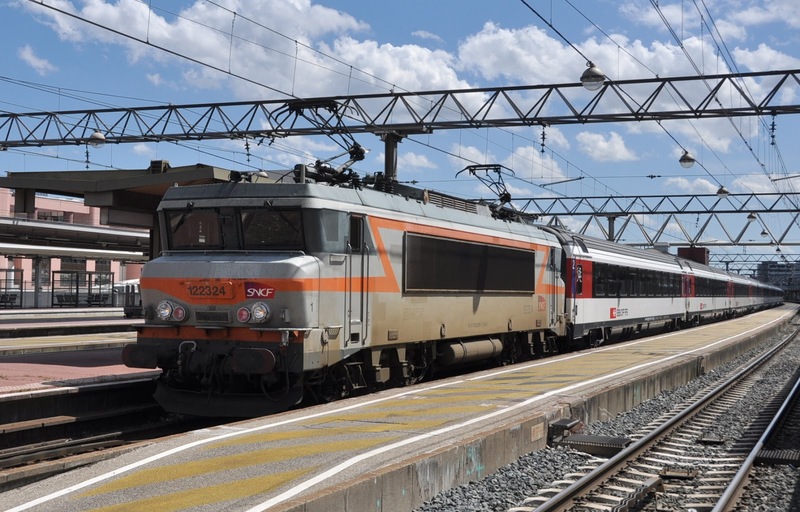 While waiting at Lyon Part-Dieu we were surprised to see 22234 with Swiss stock on the 15:36 to Geneva- is this booked??? Platform indicators were showing the train as TGV. 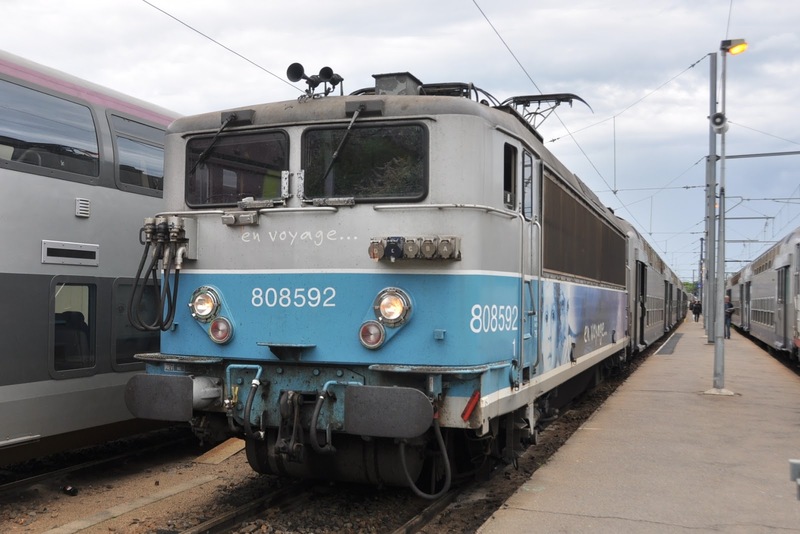 Smokey blue 67593 (Minor relief not to get major dud 67523 ex Longeau) appeared on 15:33 to Tours (Diesel to Nevers) which we took for the pleasant run to Moulins for 26042 south to Cleremont-Ferrande. 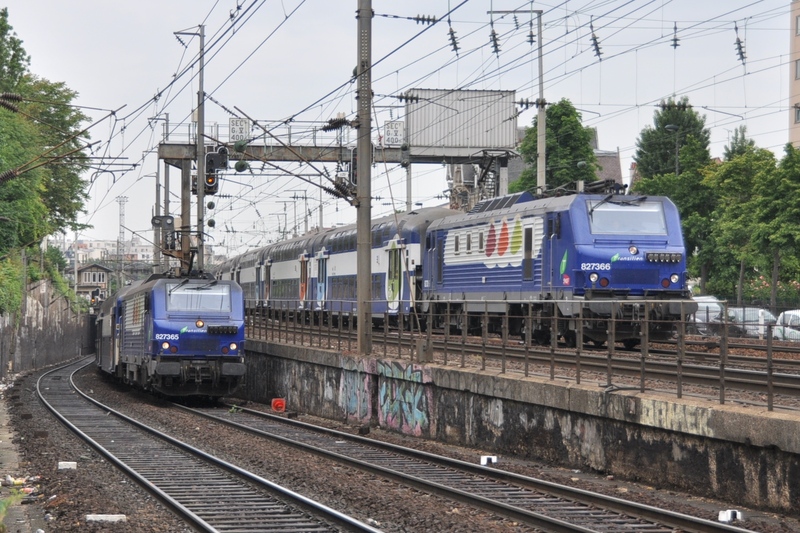 Sybics 26052, 26059, 26070 stabled at Cleremont-Ferrande. 67557 in cariage sidings and 67566 passed working 18:42 Cleremont-Ferrande to Moulins. Not the best day but at least the Tours IC came to our rescue. A very pleasant line to travel hauled. BB7294 on stock release duties at Paris Bercy- A bit of sun and a nice clean loco! Nothing useful diesel wise out of Cleremont on a Sunday morning so headed straight to Paris with 'ghost' 26006 on the 08:30. It would have been nice to have a more leisurely start but of course this is France and it was 5 hours until the next train. Another €18 res for this train... I'm sure the former Teoz trains were only supposed to be €3?? Digging works in the Paris suburbs delayed us 30 mins (as booked)- Total crawl all the way in from Melun- yawn. Walked over to Austerlitz for another 'ghost' 7221 on the 13:27 to Oreleans. Dropped back at Les Aubrais and after watching 'Carmillion' (a livery almost as bad as the ghosts) 26028 on a tours train we boarded 'ghost' (What has happened to all the 'proper' livery Sybics??) 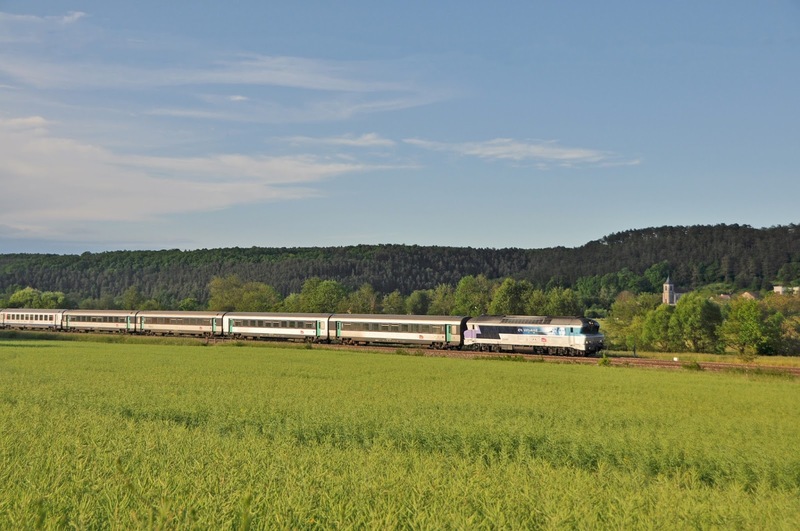 26025 ex Bourges and back into Austerlitz. 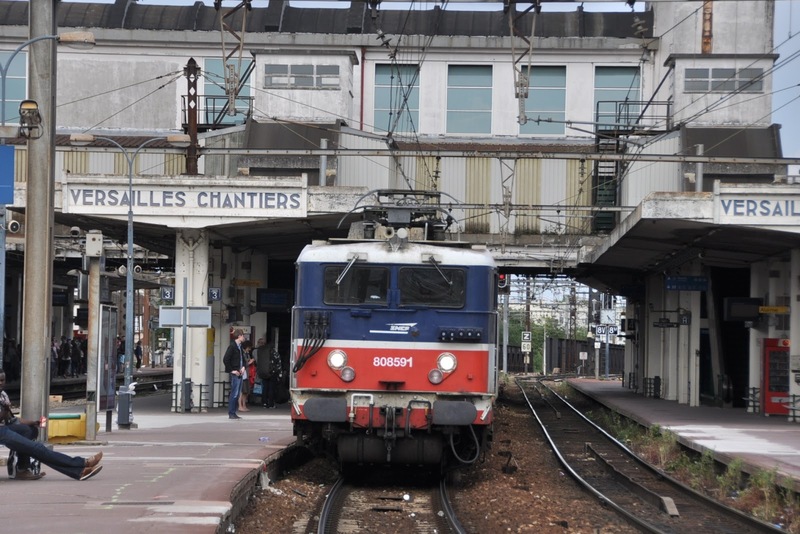 Next stop was Montparnasse to try our luck at some Sunday haulage to Chartres. For a change a bit of good luck- 8591 on the 17:09 Chartres, 8592 on the 18:09. 8588 also seen on 17:34 Chartres-Montparnasse. Not bad for a Sunday afternoon! Accommodation in Chartres was the beautiful Hotellier Saint Yves right by the Cathedral €63 twin. Note early closure of check-in. Started to rain in the evening but the 'festival of light' on the Cathedral was none the less impressive. BB8000's parked up together for the morning at Chartres. TER Centre have new units on order to replace the BB8000. A nice 'Concrete' BB7274 on the 06:32 Le Mans-Paris Montparnasse. 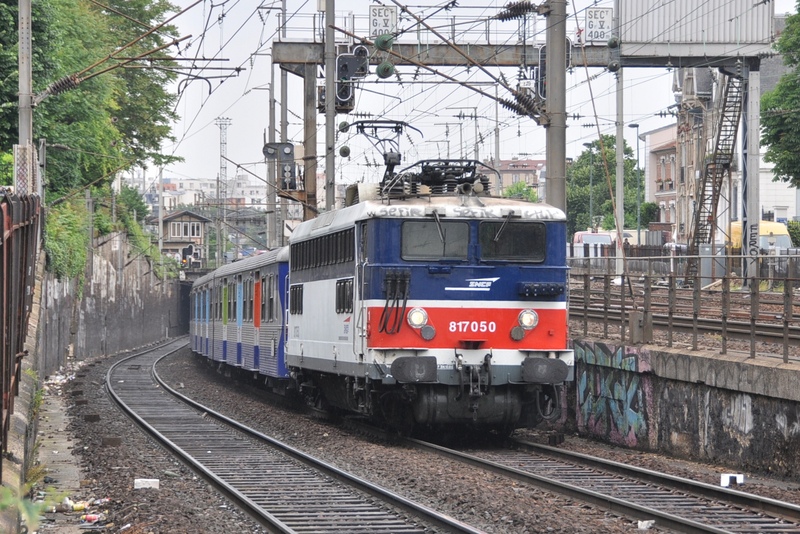 The few peak trains are the only respite from EMU's on the line into Montparnasse and are due to be replaced by units. 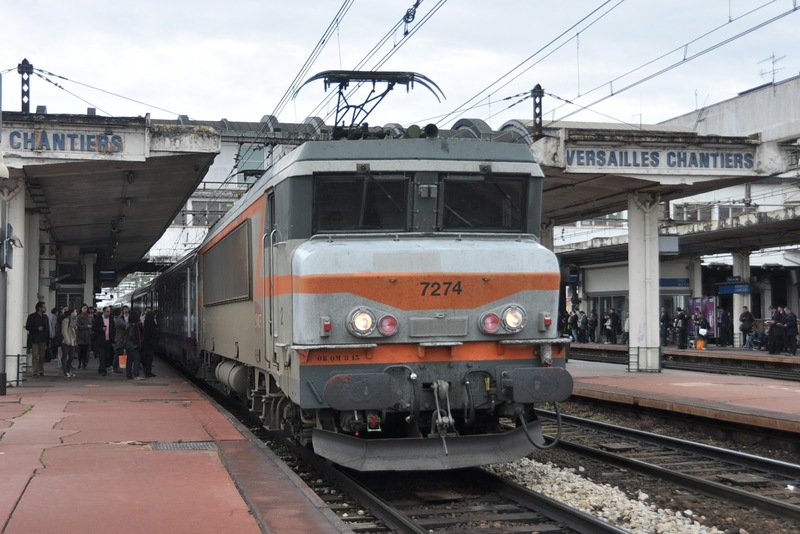 Over to St Lazare for a quick sprint out to Asniers-sur-Seine for possibly our last dose of BB17000's?. 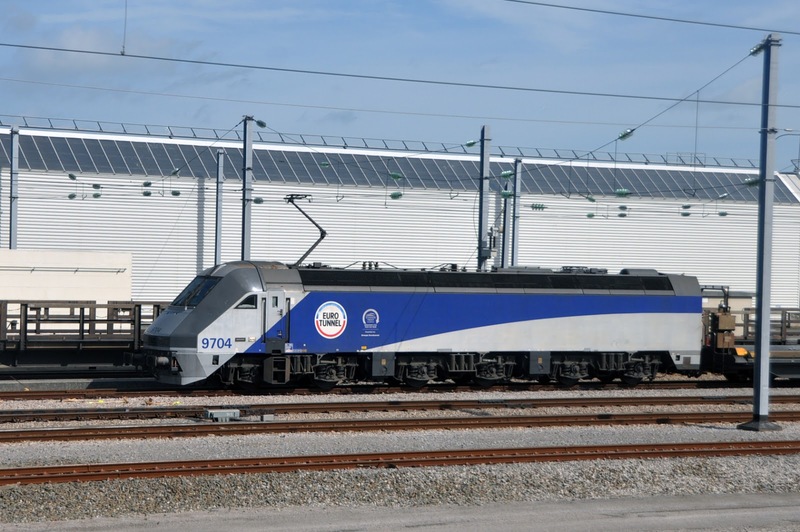 17059 sitting on the blocks about to depart with an Ermont-Eaubonne. Excellent. Departure time arrives and the train is pretty full. Lights go off. A few minutes later an announcement followed by mass sighing and everyone leaving the train. Cancelled. 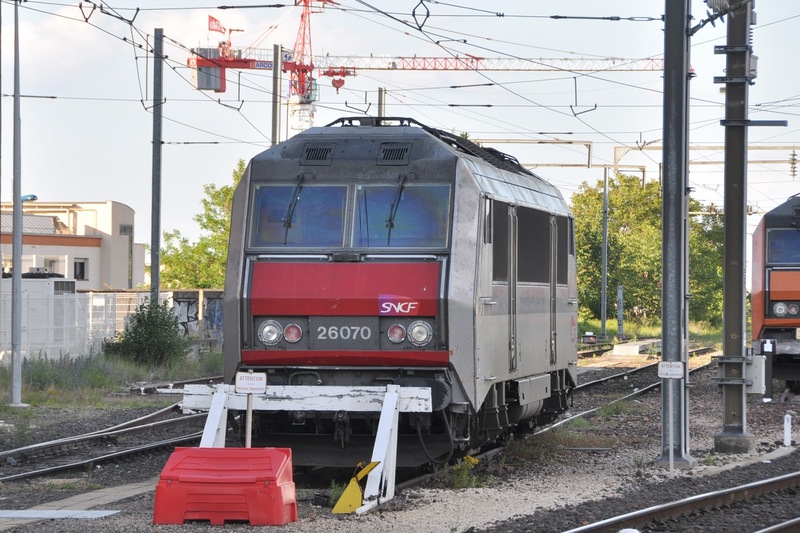 That was a winner as well- cheers SNCF! 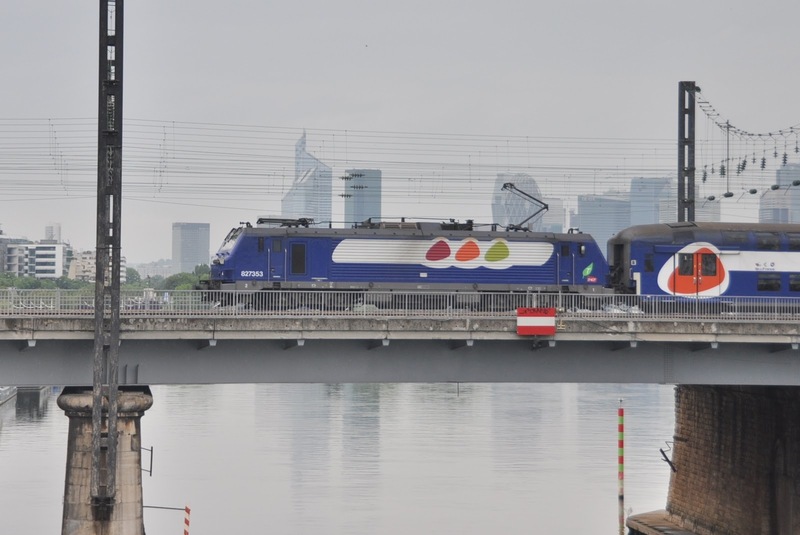 My first Francillien unit (didn't care which one) to Asniers sur Seine- in fairness they are pretty reasonable and comfortable trains. There. I said it- but apparently I didn't take a picture of it. Tried a few new photo positions here in the relative gloom. Only surprise was small diesel 63919 passing through LE. Main line locos sighted: 15021, 15039, 15038,15043 and 26012 (oh yes... ANOTHER ghost). Plenty of BB17000 about, though at least one Francillien on the Ermonts. 17008, 17013, 17021, 17026, 17036, 17050, 17059. 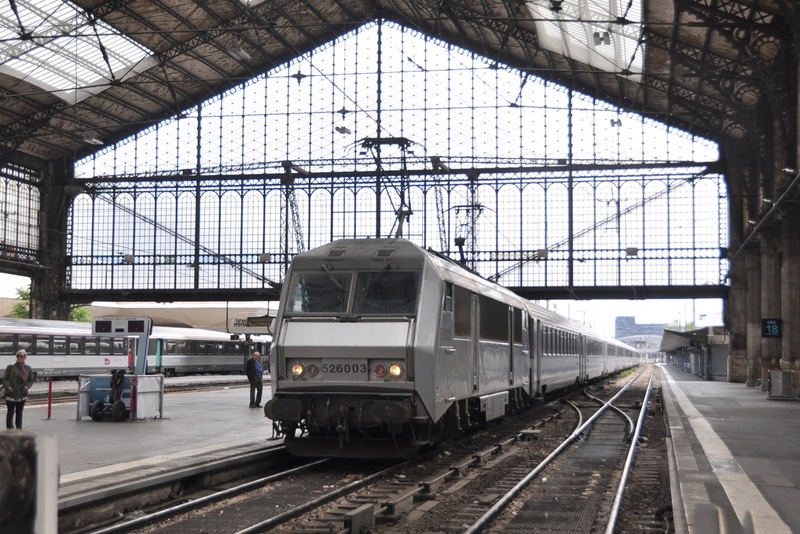 Took 17008 back into St Lazare and then over to Est. 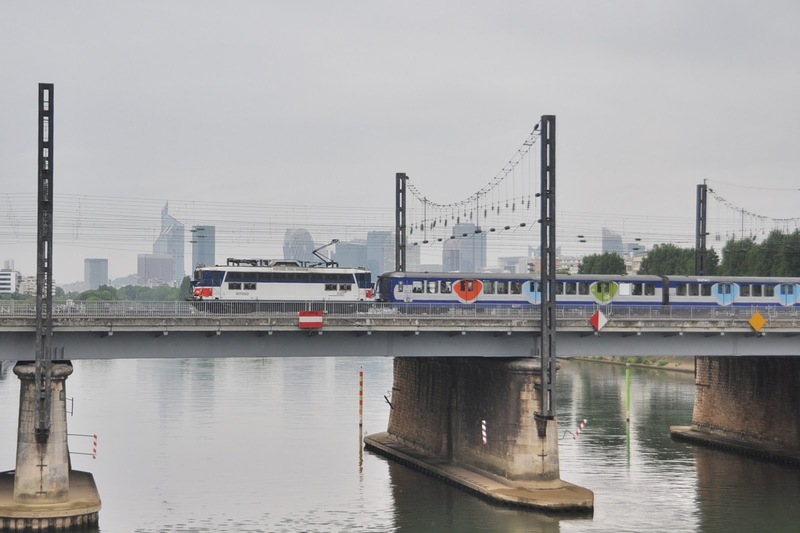 BB17050 crosses the river close to Asniers-sur-Seine. BB27300 should at least be with us for a while yet. 15063 on the blocks (and another UID at the country end of it's train). Unfortunately the 12:12 Culmont-Chalindrey was a rancid rattly pair of units as booked. 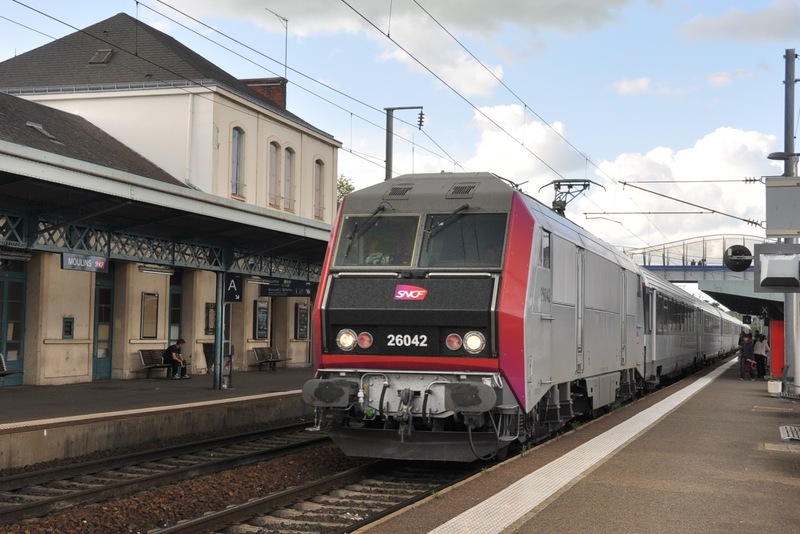 Not fun for a journey of well over 2 hours but with the 13:12 terminating at Troyes and the 15:12 far too late we had little option but to endure it to Chaumont. Back in the car now for the drive down to Longueville for the evening 'peak'. By now it was a very pleasant evening with plenty of breaks in the cloud. Unfortunately there were still *just* enough clouds to block out the sun for 100% of the big diesels. More good luck there then. A BiBi passed in sun just to spite us. 72157 near Longueville with the 16:42 Pairs-Culmont. We *just* made the supermarket in Longueville to stock up on provisions before beginning the long drive back to Calais (a good thing as there was no dinner stop). It would be fair to say we felt disappointed having missed the sun for every one of the afternoon shots, usually by no more than 30 seconds. Felt annoyed again when a pair Infra locos headed over the viaduct heading west. Oh well. Felt a little better when we hit torrential rain north of Paris and heard that back in the UK the weather had been vile all day. Maybe our not-quite full sun shots weren't so bad after all? 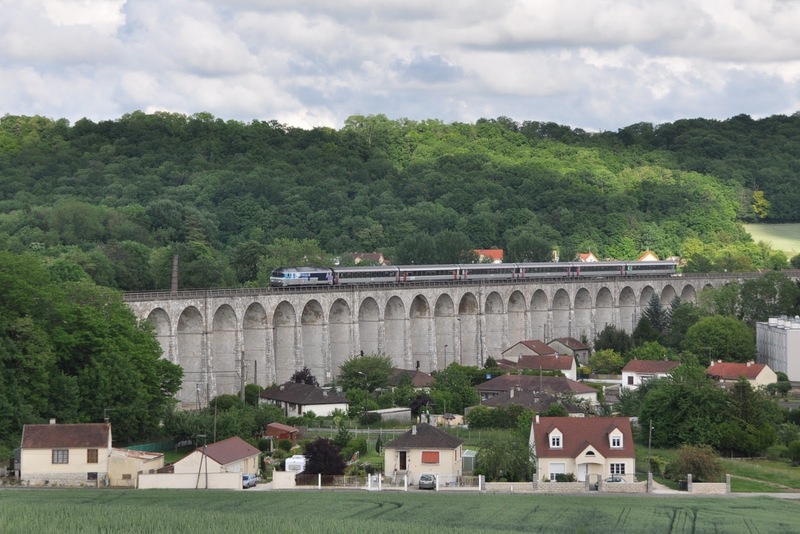 The impressive viaduct at Longueville- which would have been more impressive in the sun! CC72146(?) 16:44 ex Belfort. France is hard work isn't it!!?? An awful lot more ghastly 'ghost' locos seem to be around now- especially Sybics. Also a lot of 'Carmillion' Sybics- which I also detest. I'm even beginning to miss the 'fairly unpleasant' 'Teoz' livery which is rapidly disappearing. At least it was more colourful than what looks like overall grey. Line 4 is hard work as well- too few trains, and most of them running against the light. The long distances and near necessity to have a car to access good photo spots make this line yet more of a pain. That said the diesels look and sound great- it is worth the effort. Strike action in the PACA region was a major headache and as usual there was next to no information available. 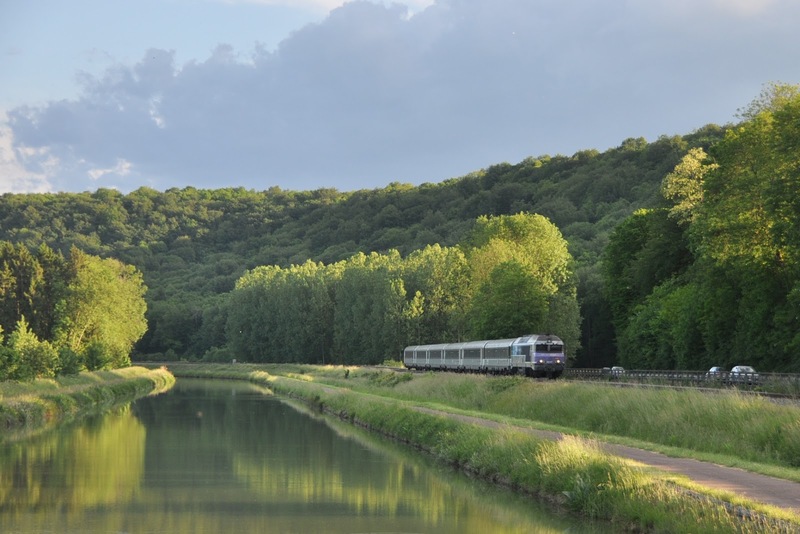 I had really hoped to tick off both scenic photos on the Cote Bleu line and riding the Cevanol this trip- I guess they will just have to wait for another time. Covering Lyon- Nevers hauled was a highlight- and something I would probably not have bothered with otherwise. Final thanks to Rhys Jennings for the company and (almost) faultless map reading. Some great photos there. Wish mine were half as good as that. 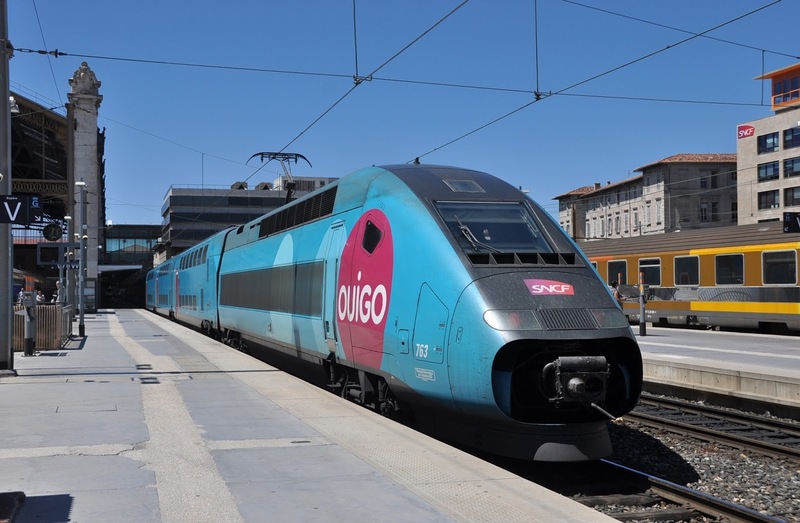 France should continue to offer some decent trains for a while yet. Where to start in Beijing?